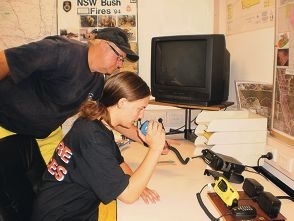 Wanneroo Volunteer Fire Support Brigade Lieutenant Ron Clark takes recruit Cara Rummey through radio communications procedures. The Wanneroo Volunteer Fire Support Brigade attends all major incidents in the region, with members providing radio and internet communications and management support, as well as tracking. Cara Rummey was among a recent group of recruits who attended a basic training course for all the local brigades in Wanneroo recently after looking for an activity to do outside her Year 12 studies. Some have mechanical knowledge, others managerial or computer skills, and all a willingness to help, with the brigade also assisting at Fire and Emergency Services and Department of Environment and Conservation incidents. Visit www.wanneroosup-portbfb.org.au or call 0427 026 006.